Aztecs used a sophisticated calendar system for the calculation of ordinary days and religious ceremonies. The Basic structure of Aztec calendar was also used by other ancient civilisations of Mesoamerica. The Aztecs added their own features to this calendar and adapted it to their own needs. This Aztec calendar had two parts: one was a 365-day calendar cycle called xiuhpohualli meaning "year count" while the other part was a 260-day ritual cycle known as tonalpohualli meaning "day count". The Aztec culture was the last of the great Mesoamerican cultures and so naturally there were a lot of cultural and religious influences from the previous Mesoamerican civilisations. They carried along the traditions of the classical Mesoamericans who developed sophisticated ways of determining the passage of time and years. The Aztec calendar, in particular, was influenced by one of the earliest of Mesoamerican people, the Olmecs. Since the Aztec calendar consisted of two calendar cycles, it had two main purposes. One was the calculation of ordinary days and years and had a 365-day calendar cycle. This particular calendar cycle is also known as the agricultural calendar since it was based on the sun. The other calendar cycle was used to keep track of religious ceremonies and was thus considered a sacred calendar. This one had a 260-day ritual cycle. Both these calendars coincided after every 52 years had passed. The two more or less independent calendars constituted the Aztec calendar system. The day signs on this calendar system are represented by different images and are also associated with one of the four cardinal directions. While both agricultural and religious calendars are more or less independent, they coincided after every 52 years. According to the Aztec beliefs, sacrifice needed to be offered to gods at the end of this 52-year cycle, in the absence of which a cataclysmic event could take place. The calendar system thus bore heavy religious influence, just like several other aspects of the Aztec culture. The 260-day ritual cycle on the Aztec calendar was called tonalpohualli which means “day count”. On it, each day is represented by a combination of a number from 1 to 13 in addition to one of the twenty day signs. The number and days were incremented with each passing day. For instance, it started with 1 Crocodile followed by 2 Wind and so on up to 13 Reed. The cycle of number and day signs on tonalpohualli continued until the 20th week. This resulted in 260 days in total (13×20) after which the sequence was repeated again. Thus the 260 days on this sacred Aztec calendar were divided into twenty periods of 13 days each. These 13-day weeks are often referred to as trecenas by scholars. Each of the twenty trecenas in the calendar had a specific deity associated with it. On the Aztec calendar, different signs or images are used for the day counts which are also associated with one of the four cardinal directions. The day signs start with 1 cipactli meaning crocodile, with an actual image of the crocodile used to represent it. This image is associated with the east. It is followed by 2 Ehecatl meaning wind which is associated with the north. and all the way until 20 flowers associated with south. 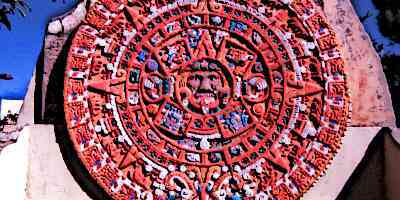 20 periods of 13 days were used to organise the total of 260 days on the sacred Aztec calendar. Each of these 13-day periods is known as trecenas. The calendar date of the first day of the 13 days in a specific trecena is used to name that trecena. Additionally, a specific deity was associated with each of the twenty trecenas in the 260-day sacred calendar. Xiuhpohualli was the Aztec year count, also known as the Aztec agricultural calendar since it was based on the sun and had a 365-day cycle. 360 of these days were named while 5 were nameless. These 360 days were divided into 18 periods of 20 days each. With the Spanish influence, each 20-day period became to be known as veintena, although the name used by the Aztecs for these periods is unknown. A specific festival was associated with each of these 20-day periods. Some of these festivals included Tecuilhuitontli meaning “Feast for the Revered Ones”, Huey Tecuilhuitl meaning “Feast for the Greatly Revered Ones”, Miccailhuitontli meaning “Feast for the Revered Decreased” and so on. With the conquest and destruction of the Aztec Empire, much of the information about Aztec calendar was lost. Over the subsequent centuries, however, various attempts have been made to reconstruct the Aztec calendar. The accepted reconstruction of Aztec calendar is the one proposed by Rafael Tena which asserts that the first day of the Mexica year was February 13 of the old Julian calendar of February 23 of the Gregorian calendar. Various other aspects of the calendar have been varied using the same count. Aztecs had their own calendar with sophisticated calculations for years and religious festivals. This Aztec calendar had two parts: one reserved for the calculation of religious festivals and the other one for the calculation of ordinary days. The first consisted of a 260-day cycle while the other one had 365-day cycle. The first one, known as tonalpohualli, was divided into 20 periods of 13 days each while the latter, known as Xiuhpohualli, had 18 periods of 20 days each. With the conquest of the Aztec Empire, much of the information about Aztec calendar was lost and it has been reconstructed only partially in later times.